How can I change the units in the software ? Step 1: Enter the Data menu in the top left hand corner of the screen, and select the "Variable Manager" option. Step 2: A window will now appear. Click on the small cross to the left of where it says "Common". Step 3: This will open up a sub-menu. 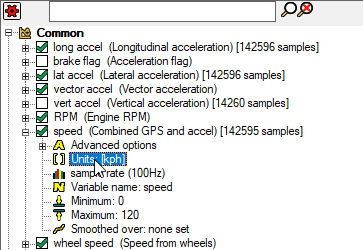 Click the small cross to the left of the word "speed", and then click on "Units". Step 4: This will open up another window. By selecting the downwards pointing arrow to the left of where it says "Units as displayed", you will pull down a menu showing the various different units of measurement that you can choose from. 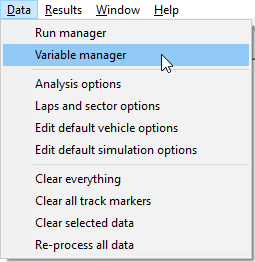 Select the one that you want and press "Ok"
Step 5: You will now be returned to the Variable Manager window. 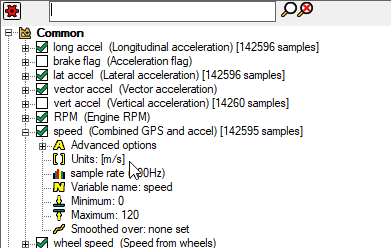 You will see the new unit being applied to the "speed" variable.